The humerus, a.k.a. the upper arm bone is the largest and longest bone of the upper limb. It is a comparatively thick bone with a large, smooth head at the proximal end and a number of projections a.k.a. “process” at the distal end. 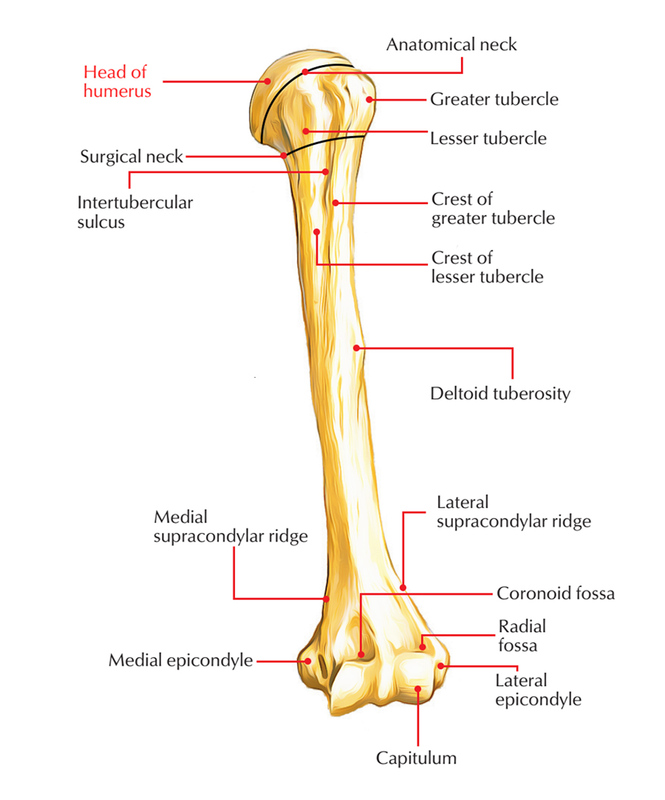 The proximal end of the humerus consists of. The greater and lesser tubercles. The superior half of the shaft of the Humerus. The head is half-spherical in shape and in order to articulate with the considerably smaller glenoid cavity of the scapula protrudes medially and a bit superiorly. The greater and lesser tubercles are noticeable markers at the proximal end of the humerus and function as connection spots for the four rotator cuff muscles belonging to the glenohumeral joint. The superior facet is for attachment of the supraspinatus muscle. The middle facet is for attachment of the infraspinatus. The inferior facet is for attachment of the teres minor. The lesser tubercle is anterior in position and a large smooth impression marks its surface for connection of the subscapularis muscle. A deep intertubercular sulcus a.k.a. Bicipital Groove/Intertubercular Groove/Sulcus separates the lesser and greater tubercles and continues inferiorly over the proximal shaft of the humerus. The tendon of the long head of the biceps brachii passes through this sulcus. Roughening on the lateral and medial edges and on the floor of the intertubercular sulcus mark sites for the attachment of the pectoralis major, teres major, and latissimus dorsi muscles, respectively. The lateral rim of the intertubercular sulcus is constant inferiorly together with a large V-shaped deltoid tuberosity midway along its length on the lateral surface of the humerus, which is the point at which the deltoid muscle inserts on the humerus. In approximately the same position, there is a thin vertical roughening for attachment of the coracobrachialis muscle, however on the medial surface of the bone. The anatomical neck is very short and it is created by a narrow contraction instantly distal towards the head. It is found in the middle of the head and the greater and lesser tubercles laterally, and between the head and the shaft more medially. It is constriction at the margins of the rounded head. With the exception of superiorly where the capsule is deficient, for the passage of tendon of long head of biceps brachii, it provides attachment to the capsular ligament of the shoulder joint; medially the capsule extends down from the anatomical neck to the shaft for about 1-2 cm. It is short contraction in the upper end of the shaft beneath the greater as well as lesser tubercles/underneath the epiphyseal line. It is related to axillary nerve and posterior and anterior circumflex humeral vessels. For the reason that it is weaker than the more proximal regions of the bone, it is the most vital feature of the proximal end of the humerus, hence it is one of sites where the humerus commonly fractures causing damage of related nerves and vessels. It is the link between diaphysis as well as epiphysis. It is characterized using an epiphyseal line in the adult bone. It is a true joint of head with the shaft.